A.M. Felt a lot better yesterday morning, the chest constriction was gone. However, still did not feel 100%, but good enough to go to church and stay there for all meetings. Came home, then remembered that I had forgotten to make an announcement in the Spanish branch Sunday school, so ran back (about 200 meters) to make it there before they would start. Turned out I really did not need to hurry, because being Latinos they really took their time getting out of the Sacrament meeting. However, during the brief run I got pain feedback from a paired organ right under the the lungs, I am not that good with the 3-D human anatomy, but I think the most likely organ would be the kidneys. That would make sense, because I was doing transmission fluid flush (repeated drink-leak cycle every 30 minutes) pretty much non-stop since Saturday morning. Otherwise, felt a lot stronger than the day before, but still not 100% there. I was not too worried about it because with it being Sunday I did not need to run anyway, and I made a very rapid improvement in 24 hours. This morning things were a lot better. The resting heart rate in the sitting position dropped down to 50 from 63 yesterday. 50 is about normal for me. Ran with Ted at 6:30 AM. Well, we planned to leave at 6:30, but then I could not find my shorts. So we ended up leaving around 6:45, and Adam missed us thinking we had already left. I had a dream the night before that Ted and I ran the first quarter of our run in 1:58. The reality turned out better than the dream - 1:51. My legs were really rested from not doing much in the last two days. I was getting feedback from the kidneys (I think) at first, and then that I went away and turned into a pain from mostly likely a nerve in the middle of the chest. However, aside from a minor annoyance, this did not inhibit me, and did not get worse as the pace increased. We eventually progressed to a 7:02 pace, which felt like a nice easy conversational pace, then turned around at 4 miles (28:46), and headed back. Caught up to a stray runner, his named turned out to be Justin, he agreed to join us, we backed off a bit. Then we started on the strides. Did 6 100 meter strides with 200 meter jog. The strides for me started at 19 then gradually progressed all the way to 16 on the last. Felt very strong in the strides. I actually started feeling less chest pain with each stride, which is a good sign. Finished 8 miles in 59:47. Two things worth mentioning. The bishop said in the blessing: "all of the symptoms of the illness will be gone within 2-3 days according to your faith". Interestingly enough, it had been 43 hours since the blessing at the time of the run, and the symptoms were pretty much on their way out. Also, Friday night I took Julia on a birthday present shopping trip (it was her birthday). As I was walking through a parking lot, there was a party going on, a band playing, and it was dark. It naturally reminded me of the start of the St. George Marathon. My legs were giving me very very positive feedback, and I know very well from many experience in the past that if they are talking to me like that I am going to run great. They do not have to, I've been able to run very well on occasion without that feeling, but I've never run below my expectations with that kind of leg feedback. This time is was perhaps the strongest ever signal in my entire life. I started feeling confident, like I had the Trial's Qualifier in the bag. I tried to caution myself, and remind myself to remain humble. That night in my prayer I thanked the Lord for blessing me with the fitness and the confidence in my fitness, and then asked Him to help me be humble. The moment I said it, I realized what I had just done. That was quite a slip of the spiritual tongue, it was done in faith, I knew I had done it in faith, I knew the Lord's way of humbling people, and I also knew that of all the prayers the Lord answers this kind the quickest. He is quick to give us what we really need especially when we ask for it. Well, my prayer was answered in 4 hours - Saturday morning at 2 AM I woke up feeling sick. P.M. Ran 1.65 with Benjamin and Jenny to the body shop to pick up VanGoGo in 15:51. Also ran 1 mile with Julia in 10:28. Felt almost 100%, little pain in the nerves around the chest migrating from place to place, only a very very minor annoyance. However, had an odd incident tonight. I had been playing chess on the floor looking at a very small board with Benjamin and Jenny for around 40 minutes in a rather odd position. Then I needed to go the bathroom, and when I do it is usually urgent fairly quick. So I got up really fast, did my business, and then started feeling like I was going to pass out. I breathed in deeply a few times, then laid down for a couple of minute, then everything was normal, HR at 54. A.M. Big group this morning again at 5:15. Ted, Jeff, and Adam joined me. We did a fairly brisk warm-up putting more than a minute lead on the 8:00 mile guy in 3.62 miles. Then it was time for the 2 mile tempo at marathon pace. I was still feeling mild chest pain when breathing deep, so this would be a good almost non-invasive test of true health (the one on Saturday will be rather invasive). It was dark, this made it difficult to feel the pace, or check the splits. I managed to get some, though. First mile was 5:29, second 5:30 (with the uphill), total time 10:59. The chest pain interfered with the sense of rhythm and perception of effort. I could not tell if this was my true marathon pace or not. I did feel the heart rate rise a bit too high towards the end, like as if it got hotter. This may have had something to do with being slightly overdressed, or may still be the lingering effects of the illness. Legs felt a little flaky, not necessarily weak, but when I tell them to run marathon pace, they are talking to me saying, what is marathon pace, and how long exactly is the marathon? Cooled down to make the total 7 for the run. P.M. 2 miles with the kids. First with Benjamin, Jenny, and Julia running, and the empty double stroller in 10:54. Then put Julia in the stroller. 15:15 at 1.5, put Jenny in the stroller, chased Benjamin down, was not easy, he was going 6:40 pace. Last 0.5 in 3:20 for Benjamin, probably around 3:15 for me, total time 18:35. Attacked the remnants of the chest pain with cheyenne pepper, horseradish, and garlic. Sucked garlic all day long like candy. Preliminary results appear good. Benjamin played his final soccer game. His team won again 4-0. A.M. Easy run with Ted at 5:00 AM. Picked it up on the last 1000 - ran 3:22 with the first quarter in 42 (up 0.5%), then the last 0.5 in 2:40, which had 5 90 degree turns. Total time for 6 miles was 43:46. The run felt good at both slow and fast paces. The chest pain was still noticeable when running, but reduced a lot and did not mess with the sense of pace and rhythm as much if at all. It was completely gone just on breathing deep or jumping up and down. The BINGO song was on. The killer instinct started coming back. P.M. Ran 2 miles with the kids. Had the double stroller with Jacob and Joseph the entire time. First a mile with Benjamin, Jenny, and Julia in 10:32. Then 0.5 with Benjamin and Jenny in 4:18, this put us at 14:50 at 1.5. Finished the last 0.5 with Benjamin in 3:25, total time 18:15. The chest pain has been reduced to a feeling like there might be a dust particle in my respiratory tract. Legs are feeling good, the form feels efficient, the killer instinct is increased. Still sucking on garlic as a precaution. It has a soothing influence as a positive side effect, making me get more out of my sleep. A.M. Ran with Jeff at 6:00 AM. I asked my body what it thought about the crazy Australian carbo-load technique when you run all out for 3 minutes a day or two before the race. It said it would at least not be harmful. I also had a positive experience at TOU running anaerobically for a portion of my VO2 max test 16 hours before the race, and then carbo-loading right away. So I decided to give it a shot. Jeff decided to go along with me. We warmed up 2 miles, and then went for it on a slight rolling up section of the trail from 0.625 mark of the Provo River 5 Mile Tempo to the start (probably a second longer than a true 1000). The plan was to run somewhere around 3:00, a little faster OK, a little slower OK too as long as it hurt enough, a lot faster OK as well if the speed was there, but that would have been an unexpected bonus for me - my focus has been the marathon, and it has been a while since I ran a sub-1:15 quarter on something flat, much less rolling. It was dark, so we did not get all of our splits. First quarter was 1:10, and I felt it. I backed off a bit, Jeff kept the pace to the end. I was 1:46 at 600 (really 0.375), and finished in 3:02.8. Jeff got 2:55. It did not hurt as bad as an all out 1000 should, but I just could not go any faster. Once the anaerobic bear attacked me, I had no anaerobic defense. My body said, let's go slower and longer. That is good, I'll need to go slower and longer on Saturday. Cooled down to my house, started carbo-loading right away. P.M. Ran 2 miles with the kids. First one with all three running in 11:43, then put Julia in the double stroller, 15:56 at 1.5, put Jenny in the stroller, caught up to Benjamin, we finished 2 miles in 19:39. A.M. Took VanGoGo for an oil change, ran back 2.25 with 1000 in 3:20, then took the kids, we ran back to get VanGoGo, first mile with all three in 10:47, then Julia in the stroller, 14:56 at 1.5, Jenny in the stroller, finished 2.25 in 20:06 with Benjamin reeling in the 9:00 mile guy with a long burst of speed. This report is work in progress - the note will be removed when it is complete. St. George Marathon - 2:23:57, 11th place, PR, qualified for a bummer. Explanation - 2:22:00 or faster, you qualify for the Trials, 2:24:00 or slower, just a PR. But once you are within 2:00 of the qualifier, it is a bummer if you do not get it. So today I qualified for a bummer, it is an accomplishment, not exactly the kind I hoped for, but it breaks a 4 year drought of marathon PRs. Ran my best race, gave it all. Felt like I was sprinting from the start to 23. Red-lining near the anaerobic threshold the entire time with complete oblivion of how dangerous this can be in a marathon. First 22 miles went by very fast. At 22, I said to myself, was that 20? Wait a minute, that was 22. That was the first time in my life that I ever wished it was only 20 when I was at 22. I did not care about pain or discomfort, or even a PR, I only cared about hitting the qualifier. But today was not the day for reasons not fully known to me, yet one thing is clear - there are more lessons I need to learn before God will give me the blessing of meeting the standard. After that, raise the bar, and try again. Indeed, as our motto says, Run, Blog, Improve, Repeat. First half 1:12:12 at the official clock, I think it was positioned 2 seconds too far based on where the 13 mile mark was, which is more reliable, I think. Second half 1:11:45, again, based on the official position of the first half. Some words in defense of the term bummer. The popular culture teaches positive mental attitude (PMA) and attempts to sell it as a substitute for true faith. True faith cannot happen without the ability and willingness to face the grim reality, appreciate it, feel its depth in full measure, and only then defy it with a real as opposed to a merely imagined power. Additionally, perhaps from being soaked in the PMA environment, we are at times too quick to give ourselves and others a pat on the back that is so hard that it makes it hurt for a less than a spectacular effort. While positive encouragement is not only helpful but necessary, one needs a chance to feel in depth that he shot for the stars, missed it, and be on his way to figure out what he is going to do next to reach the stars in the future. This thought process would not be sufficiently acute to produce desired results if the post-race attitude is the one of celebration. There needs to be some form of pain to prevent one from becoming complacent. Thus, while I am very happy with the fact that I broke a 4 year old PR at the age of 34 in my probably 45th (I lost count) marathon (I wonder what Tim Noakes would have to say about that), I am also happy that I have the nerve to say that I qualified for a bummer. 9 years ago I ran the same course in 2:39:48 after putting in a lot of training. I was happy that I had broken 2:40, yet the Trial's Qualifier looked so impossible, and at the same time it was calling me to reach into the depths of my soul and find a way to run faster. Had I been content to merely celebrate my sub-2:40 then, I would have never gotten anywhere close to what I did today. From the start we formed a nice pack. The pace varied depending on the terrain. We let the A guys pull ahead, but then Steve Ashbaker led us in a surge to catch up, which was OK with me. So we were all together for a while. Hit 5 miles in 26:52. Steve pressed a bit, that made the pack go a bit faster, we hit the next two miles at somewhere around 5:05 pace, but it was a decent downhill. At mile 7 the aid station handed me the bottle of Chris Rogers. I gave it back to them and told them what to do with it. In the mean time, I ended up getting nothing in the confusion, and lost contact with the pack. I caught up, then we started the climb. The A guys had more speed and power, and pulled away. Mike Kirk fell back a bit, then caught up. From then on we worked together more or less. Hit 10 miles in 54:32. Nick McCombs caught up, I tried to run with him, but 5:30 pace up Dameron was too fast for me, I felt 5:40-5:45 was what I needed. Hit the half in 1:12:12. For a negative splitter, this would have been just perfect. For me this looked promising but dangerous, even though I was feeling good. I had plenty of opportunities to latch on to somebody and run faster. Yet, my body was telling me this was the fastest I could hit the first half without having negative consequences on my overall finish time. This was not a good feedback, nevertheless I promised to myself that I would rather die trying to qualify than be merely content to run a PR. So from then on, I erred on the aggressive side and did my best to override the system feedback. Hit 15 in 1:22:12. That is 57 seconds behind the 5:25 guy. There is still hope, we are closing. A little mishap at 15, do not think it cost me the qualifier, maybe 20-30 seconds max. My bottle with Hornet Juice was not there. I was counting on it. I stopped and tried to find it. After about 5 seconds I realized it was hopeless, and just kept going. I ended up getting nothing at all 15. Lesson learned - I will not do bottles any more unless I am running in a race that makes you do it. I get plenty of fuel just from the regular drinks, and the bottles only add extra stress and confusion. The confusion cost me broken rhythm and loss of contact with Mike Kirk, Mike Vick, and Steve Macintire. However, I do not think it cost me as much as 1:57. The "Heart-Break" hill felt like a minor rise. Good sign, except it broke the rhythm again, and set me back in the chase of the 5:25 guy. Logan Fielding went by. He moved so fast I could not latch on. I thought barring a severe disaster he was going to get the qualifier. I felt like saying to him, Logan, go get it for the Blog for me, if I cannot today. Hit 20 miles in 1:49:09. The OTQ guy is now only 49 seconds ahead. There is one problem though - he does not slow down on flat or uphill, and he does not slow down after 24, while I do. It was very clear from the split, and how I felt, that barring a disaster, I had a PR in the bag, and barring a serious but still remotely doable miracle, the OTQ was out of range. Nevertheless, I told myself that it is better to risk missing a PR while trying to get the qualifier, than just give up. I floored it on the next downhill mile hoping to gain momentum, ran 5:03, this gave me hope, next one 5:38 with less downhill and more uphill, still a glimmer of hope remaining, then 5:22 instead of 5:00 on a downhill mile, followed by a 5:48, then it became painfully clear that the trials qualifier guy had hopelessly run away. Iain Hunter came by. I was a relative zombie by then, could not latch on. Ran another mile in 5:48. Heard steps behind me. I said to myself, if this is Clyde, I am going to strangle him. Not for beating me, but for being in shape to qualify, and not trying by starting on pace. It was Kelly Mortenson. He was not as lively as Iain, so I was able to latch on for a bit. But then I could not go. Mental note for trying to run in The Zone next time - one minute on one minute off. I think the limit can very well be at least partially neurological, and the nervous system actually might be able to deal with the surges better than even pace at that stage. 2:16:48 at 25. The clock at supposedly 25.2 was in the wrong place, too far away from the finish. Why put up a clock at a random location in the race to confuse the already confused runners? Stumbled my way through the next mile in 5:57, then saw I could beat the 2:24:00 guy, kicked, managed 1:12 for the last 385 yards thus qualifying for a bummer (within 2:00 of the standard)! The bloggers did great. To start with, Paul got standard A with 2:18:08, and Logan standard B with 2:21:45. I have particularly fond feelings about Logan getting it. I feel he got it for the Blog for me. He mentioned in his blog that he feels he does not deserve it. Nevertheless, there is a reason, and whatever it might be, I am very happy we will have two people from the Blog at the Trials. There were three more bloggers who cracked 2:30 setting PRs - Steve Ashbaker (2:25:18), Clyde (2:25:50) - after reading his report I do not feel like strangling him, he really ran his best, and Dave Holt - 2:26:54. We captured 10 spots in the top 25 in the race. We had numerous "impossible" PRs. Over the course of the next week I will visit each blog individually and leave my thoughts. It boggles my mind what we have accomplished. Consider Paul - he ran for Calvin, a division III college. His best 5 K was 14:47. He could not even crack 30:30 in a 10 K. He was a good college runner, but by far not a stand-out, just one of many point scoring workhorses. After college is he is falling through the cracks. Not much is happening in his career. 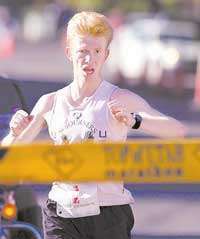 He is getting beat in local 5 Ks and 10 Ks, tries marathons, gets beat up and left in the dust in any race of significance. Finally he gets injured, and cannot even run for a year. Looks like a typical case of a post-collegiate failure, he is headed for the runners junk yard or meat factory, depending on which metaphor you like better. Wrong! He joins the blog, finds a support network, recovers from his injuries, discovers better ways to train, and in a year goes from the butcher's knife candidate to qualifying for the Trials with standard A with room to spare! Look at Logan. We have a guy that ran 2:41 in St. George last year, followed by 2:55 crash-and-burn in Ogden this year. He never ran for anybody, in fact he started running at all only 3 years ago. He is not "cool", he has not been through the ranks of high school and collegiate running at all. But he does not care. He joins the blog. He sees guys training twice a day running 100+ miles a week. He says, I want to give it a shot, is this a good idea? We tell him, yes, go ahead, give it a shot. In 6 months, he runs a Trial's Qualifier. How can God raise children unto Abraham out of the stones? He gives us blessings based upon our faith and how that faith is manifested through our works, not just based upon the gifts we've been given, or our past accomplishments that may have had to do more with our talent than our diligence. Applying this to running - nobody needs to feel that because they are not "cool" (high-school star, All-American in college, etc), they cannot accomplish something noteworthy. You may feel like a stone, but out of that stone through faith and hard work on your part God can raise a great runner.